The Great American Smokeout is a great time to get serious about smoking cessation. Don’t wait to make it a New Year’s resolution. Do it now. Can’t do it now? Do it Monday. In fact, do it every Monday. It’s a fight. If you fall down, start it back up again. It’s the fight of your life (or should I say for your life)! If you decide to quit after your current (last) pack, throw away one cigarette for every one you smoke. Count (figuratively or literally) all the money you’re saving by not smoking. Throw away (not give away) all cigarettes, cigars, matches, lighters, humidors, cigar cutters and anything else you associate with smoking. You’ll realize how sad it is if and when you find yourself rummaging through the garbage to get a fix. Tell everyone (loudly) that you’ve quit. Empower them to help and hold you accountable. Enlist another smoker friend to go through the journey with you. If you do fall off the wagon, smoke a different cigarette brand. Odds are you won’t like it as much, and that will help combat the natural ease you have with smoking. Contact your physician and ask for help. 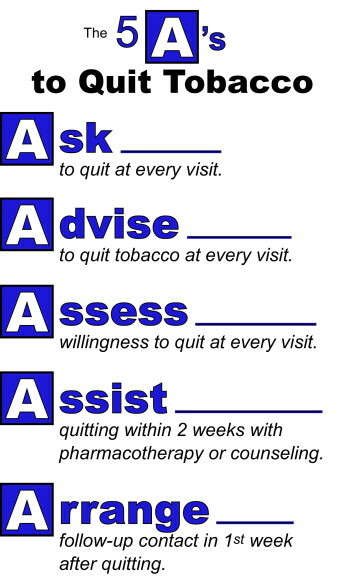 Here’s a marvelous best-practices schemata of appropriate interplay between a physician and a patient trying to stop smoking. If your physician and you decide to place you on a patch or otherwise medicate you, follow instructions carefully and precisely. Practice deep breathing. Part of the euphoria of smoking is nothing more than the physiologic sensations produced by deep inhalations. Keep other things in your mouth. Mints and chewing gum (low-calorie) are great. Brushing your teeth also serves many purposes. Drinking water when you want to smoke will often remove the urge. Make it past the first day. Then make it past the first week. I personally love the START method, which includes several of the above methods. Let me know if it works for any of you. S: Set a quit date. T: Tell your friends, family and associates that you’re quitting, and enlist their help. A: Anticipate and act on the plan you’ve set and challenges you’ll meet. R: Remove (trash) cigarettes, cigar and other paraphernalia from your environment. T: Talk with your physician about options and additional support. For those of you affected (either first or second-hand), this is huge and important. I really wish you all the best. I welcome any comments or questions.